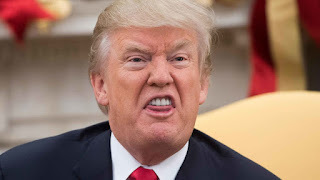 Many Duluthians and other area residents who do not support President Donald Trump are not pleased that he is holding a political rally in Duluth on Wednesday, June 20. I am among them. I initially decided to simply ignore the event, but that will be hard to do due to the intense media coverage of the rally. So simply ignoring it will be impossible. I have come up with the following list of more pleasant things to do during the rally for those who simply can’t stomach the visit. Haul a load of garbage to the area landfill. Buckle down and begin working on next year’s taxes by listing itemized deductions so far this year. Set about cleaning the oven in the kitchen stove by hand scrubbing, positioning yourself on your knees. Search your lawn for weed growth, removing any incipient infestations with a metal-pronged tool and depositing the residue in a compost heap you can start in the next recommended item. Put aside long-standing delays by starting that fun compost heap that you’ve been intending to establish for potato peelings, eggshells and other items, such as lawn weeds. Paint something — anything in the house like a kitchen or bathroom using oil-based paint for difficult, messy cleanup. Visit a dentist and have him or her yank those crooked teeth to make way for an improved smile. View a video of an opera. Any opera. (Actual opera lovers are exempt from this recommendation.) Warning: Do not include “Nixon in China” by John Adams (not THAT John Adams). Discover Duluth’s out-of-the-way attractions and historic sites such as the site of the former sludge pond near a one-time slaughterhouse on Oneota Street, or the dump in Gary-New Duluth where construction debris is deposited. Eschew former inhibitions and go ahead and build a birdhouse in the garage. Brush up on your Shakespeare. Visit a proctologist to discuss upping the rate of your colonoscopies. These are just a few suggestions for ways to stay happy and contented during the Trump visit. Be creative and come up with ideas of your own, such as crawling into bed and assuming the fetal position with your thumb in your mouth. Close eyes. Note from Jim: The 2018 MN legislature appropriated money for refurbishing Duluth's Lake Superior Zoo. Alas, plans are not to include an elephant. I thought it would be respectful to old Bessie, the Zoo's long-gone elephant, to re-print this Zenith City Online post remembering her. To begin with, there was an elephant. Just one. It had its own house at the Duluth Zoo, and an elephant is hard to ignore when it’s in a room. I saw it many times as a child and youth visiting the zoo starting in the 1940s. Bessie was the elephant’s name—I was reminded when I read Nancy Nelson’s monograph of our zoo here on Zenith City. What I have to add are mainly personal impressions and recollections of the city’s approximately 90-year-old zoo, which has greatly evolved through the years of my consciousness and patronage of it. There are references to Bessie in newspaper articles from the late 1930s, and she was around for many, many years after that. I always felt a little sorry for this lone elephant when I stood in her presence. She was billed as “the dancing elephant” for reasons I can understand. Most of the elephants I’d seen were in movies or circuses. When Ringling Brothers and Barnum & Bailey set up its big top in the Wade Stadium parking lot in about 1950, they brought 35 elaborately costumed elephants in to lead their opening parade around the three rings. Then there were the elephants in Tarzan movies, always coming to the rescue at Tarzan’s beck and (very distinctive) call. And then there was Bessie, standing in her custom-built house (high ceilings) at the Duluth Zoo, shackled in her wing, rocking constantly back and forth as though she were nervous about something. She probably was: She had no companions of her species. She had to be lonesome, if I may apply a human emotion to a pachyderm. Also, she seemed to grow long hair on her back, which surprised me. Other elephants didn’t have any hair. Bessie wasn’t covered with it by any means but there it was. I assumed, probably incorrectly, that she grew it in reaction to our cold climate, whereas African and Asian elephants in their native habitat didn’t need it. Bessie was Asian, by the way. You could tell by her ears. But enough for now about the zoo’s only elephant, whose demise and disposition I will get into later. First, some general impressions of the old zoo, and a little history. Unlike today (I visited the zoo again last fall with a few of my grandchildren), back when I visited the zoo as a youth, the main building stank to high heaven. I’m sure they did their best to clean up after the lions, tigers (but no bears there) and monkeys, but it was not welcoming. That has been eliminated today. Unlike so many people, I have never cared for monkeys or primates in general. Maybe it’s because they remind me of me. It seemed to me that the lions were always sleeping when I viewed them. The tigers paced their cages, just as they always do when in a confined area. There are much better accommodations for them today. Bears were kept in their impressive open-air dens with numerous caves where they could hide from people trying to view them, especially me. Nearby frantic wolves in room-size cages eyed a small herd of whitetail deer not far away, kept behind a tall fence in a wooded area. As a newspaper reporter much later, I can recall doing a story about an intrepid deer hunter, apparently frustrated in the woods, assaulting one of the zoo deer with a knife and spiriting the remains away. You want venison, you want venison. Oh, there are so many zoo stories (not to be confused with Edward Albee’s absurdist play, <The Zoo Story>, which has little to do with zoos). For many years, well into the 1960s, a black bear with a large white V on its chest was a popular attraction—perhaps to some the V signified America’s victory in World War II. A zoo director with whom I had become acquainted accidentally caused the V bear’s death, and lost his job because of it. That was one beloved bear. The director, who always wore snake-proof boots, not so much. Let’s not forget the Richard Griggs menagerie of stuffed African beasts he had shot on his many safaris. Griggs, a Duluth tycoon and philanthropist (Griggs Field and Griggs Hall at UMD are named for him, as he donated much of the land on which the college is built), had many of his kills stuffed as trophies—and built a wing on the zoo’s main building to house them. There was some disgruntlement at the time by those who believed zoos were for displaying live animals and not dead ones, but money talks and the addition, now the Griggs education center with just a few of his stuffed animals, was built. Finally, let’s get back to Bessie, the lonely elephant. She eventually died right there at the zoo circa the 1970s. Google says Asian elephants in captivity live an average of 80 years, and Bessie had to be pushing it. What do you do with a dead elephant in Duluth—or anywhere for that matter? I don’t know about other places, but in Duluth she was loaded onto a large truck and laid to rest in the Rice Lake landfill with the wretched refuse of decades of the city’s garbage. An ignominious ending for a lonely elephant a long, long way from her nativity—who knows where or when. Her disposal does give rise to wondering. What if, sometime in the next millennium or two, archeologists sifting through the northern tundra to determine what life was like way back in the 20th century came across the Rice Lake landfill? Discovering the remains of an elephant this far north might forever change theories about the distribution of animals on this planet. This post below was previously written for Zenith City Online and posted on October 4, 2016. *Editor’s Note: We found he following information about Bessie on the Lake Superior Zoo’s website: “Bessie, the elephant, was an all time favorite animal. 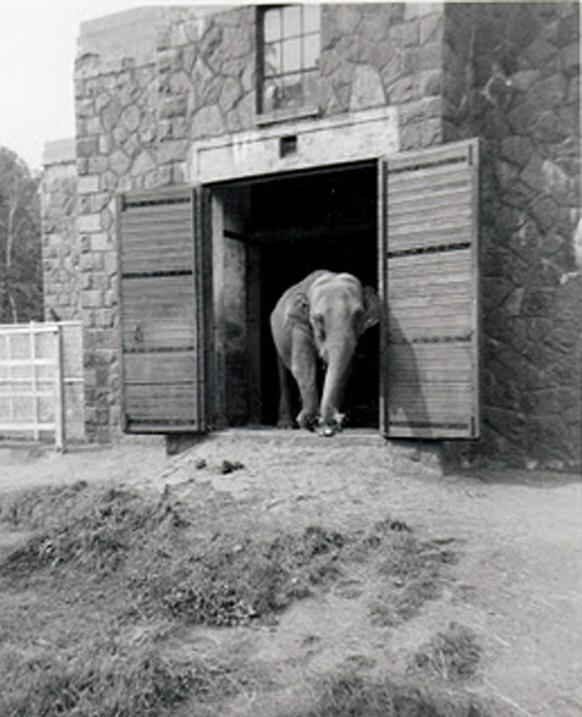 She came to the zoo in 1937 when the elephant house opened. She was 12 years old at the time. The local community knew her well. 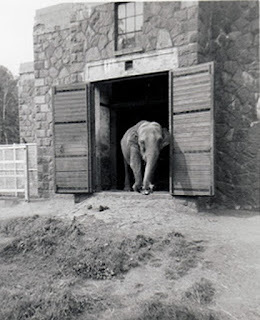 Before perimeter fencing was installed around the zoo, Bessie would often wander off the zoo grounds and go ‘visiting.’ Bessie lived at the zoo until she passed away in 1974 at the age of 49.” Catch up with all of Jim’s recollections of growing up in Duluth here.